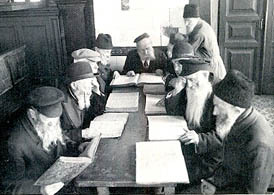 Jews study the Talmud in one of Vilnius' kloizes (a home for religious studies) on Uosto (Portovaja) street. 1937. After the destruction of the Second Temple (in the year 70 CE) the place for the public prayer of Jews became synagogue. Synagogue's building itself is not sacred, since only the Temple was considered to be the home of God; according to Jewish religious believes the Temple cannot be restored in our times, it will be revived in the future when the messiah comes. Synagogue is also the place where sermons are preached, Torah and Talmud studied. The word "synagogue" originates from Greek. In Hebrew it is called beit kneset, which means "the house of gatherings". Before WWII there were hundreds of synagogues and other homes for prayer and studies, so called beit midrash (in Hebrew) or kloiz (in Yiddish), in Lithuania. The prayer "Shma Israel" ("Oh, listen, the nation of Jews"), which preaches the central principle of Judaism - the monotheism, is the fundament of liturgy in synagogue, as well as of individual worship. Usually the service in synagogue is lead by a cantor (in Hebrew hazan). There were a lot of famous cantors in Lithuania - Vilner Balabesl (J. D. Strashunskij), G. Sirota, M. Aleksandravitchius and others. The language of Jewish liturgy - Hebrew - is revered as the sacred language, since the Bible was written in it.